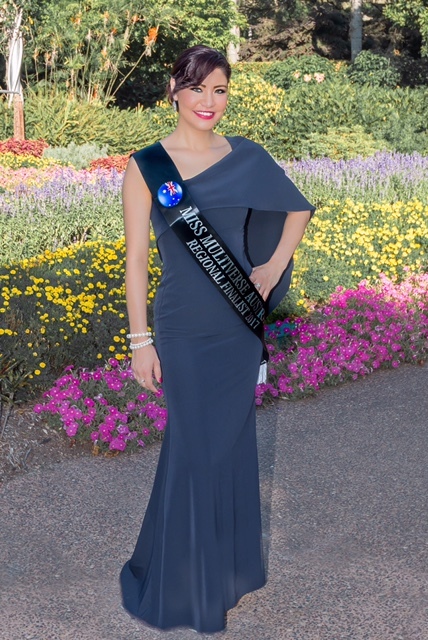 Japan born, Emily Aoki; as a young girl was bullied in school, reinvents her self becoming a model and Miss Multiverse Australia Contestant. Emily’s mixed race was the cause for the bullying she went through as a young girl in school. This negative experience gave her the motivation and determination to re-invent her self to become a role model for other young women. Emily moved back to Japan and worked as a flight attendant. Because of being bullied at a young age, her self image reflected outwards in to her every day life, this manifested in her work and friendship to the extend of affecting her marriage and family. Today, Emily is back in Australia and working as a model and flight attendant. Although Emily did not make it through to the National Finals, she feels that her time as a Regional Finalist help her built her confidence. With her face, her body and her modelling skills elevating her score, Emily’s English skills prevented her from getting through to the next round. Considering the hardship of her youth, this gave her the courage to turn a negative in to a positive. Emily made a great success of her life. and is proud to be a role model for many young women. Emily is currently residing in Brisbane, QLD, Australia.